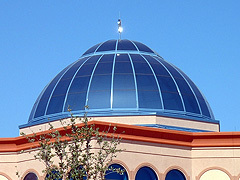 We offer a full line of glass products for any architectural application. 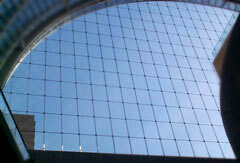 Dlubak is one of the country’s principal suppliers of curved glass to the architectural glazing industry. Our production capacity and ever expanding processing capabilities allow us to offer you curved glass in a wide variety of sizes in many composites including laminate and energy efficient dual sealed insulating units. Dlubak’s curved glass is the product of choice for all architectural applications such as exterior vision and spandrel areas, skylights, solariums, covered walkways, interior walls and hand rails. Our specialty product division offers a variety of glass enhancement services including the application of graphics, abrasive etching and fabric encapsulation. 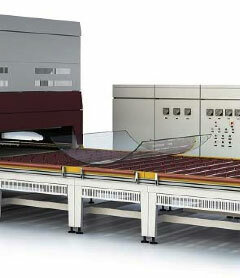 Monolithic and non-laminated curved insulating glass can be produced in sizes as large as 100” x 170”. However, shipping, handling, and safety considerations should influence the maximum size to be processed for a given project. Dlubak Specialty Glass is one of the country’s principal suppliers of curved glass to the architectural glazing industry. We are thrilled that we are expanding our production capacity to include a state of the art bent tempering oven. We now can offer you curved glass in a wide variety of sizes in several different make ups including TEMPERED, LAMINATED, and ANNEALED and available to manufactured into energy efficient dual sealed insulating units. Dlubak’s curved glass is the product of choice for all architectural applications such as exterior vision and spandrel areas, skylights, solariums, covered walkways, interior walls and handrails. Our specialty product division offers a variety of glass enhancement services including the application of graphics, abrasive etching and fabric encapsulation. 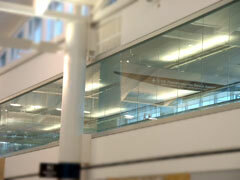 Laminated glass can be produced as large as 96” at the chord or “point to point” dimension. The height dimension can be 17′ or 204″ maximum. Tempered glass, please consult customer service. 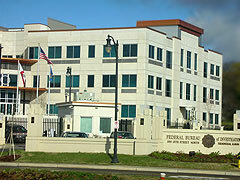 Dlubak has the ability for insulating security, ballistic, heavy glass, and units for standard window applications. Our enviro-pane is available in air and gas filled units. We are able to utilize our heat treated or tempered glass, and specialty laminated glass in these units in combination with energy efficient products. Dlubak is tough on mother nature. We are the authorized fabricator for the hurricane resistant interlayer products that meet large and small missile protection for commercial and residential projects. 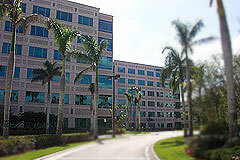 Our glass products have been successfully tested and used in systems to meet building codes. 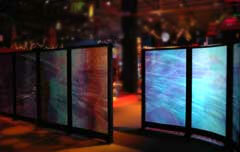 Dlubak is the only source for decorative patterns and graphic silkscreen designs for flat or bent glass products. The Dlubak color and pattern laboratory has hundreds of design patterns and thousands of colors. From standard stripe and dot patterns to custom art work, our only limitation is your design imagination. Once a pattern is selected, choose either a standard color or custom color ceramic frit to compliment your metal framing or color scheme. 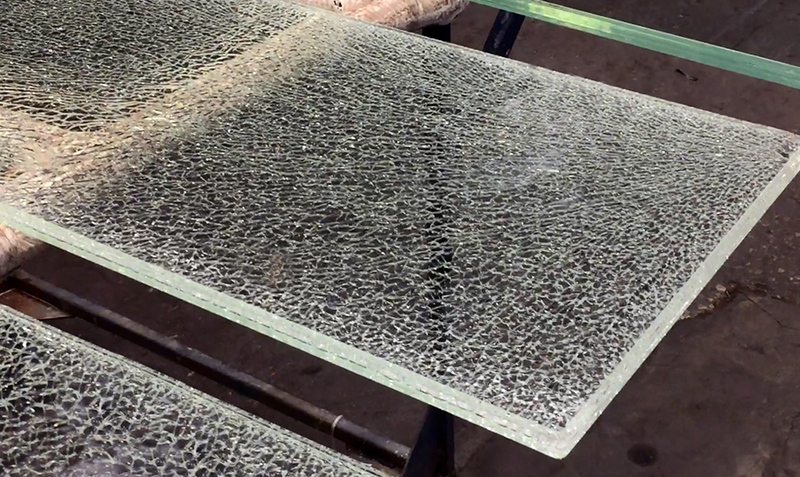 Multi-ply cracked glass product that can be used in a decorative interior application. Dlubak has the capacity to laminate everything from security laminates to custom graphics. Our specialty laminated glass has been utilized in projects such as windows, curtainwalls, skylights, interior office partitions, and design walls. We will work with our customers, builders, and architects to develop their vision with our standard and custom interlayers.